And you should’ve seen the glare I received. It is not one of those books. Yes it’s about someone who has cancer but it’s not a cancer book. I often think that some writers think that if a book is about (or, in this case, features) a difficult subject then their readers must be crying all the way through the book to show that they have succeeded in handling it in an honest and realistic way. Thankfully, Mr Andrews shows that this is not the case. Although, while I’ve been writing this I’ve realised that, in my trying to convince you this that this book isn’t about cancer, all I’ve done is talk about cancer. So, one last time with feeling or… um…y’know… bold writing. THIS BOOK ISN’T ABOUT CANCER. So seeing as I’ve just been chatting on about this book is not about, I should probably talk about what it actually is about, shouldn’t I? 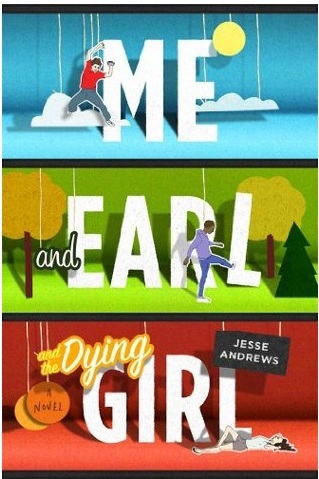 This book, in a nutshell, is about a boy stumbling wildly through adolescence with the help of a brilliant and hilarious friend named Earl. Except I don’t really mean help… because Earl doesn’t really help him as such. He just swears a lot and is gross and crude and is just generally brilliant at random intervals throughout this book. Throw in some fantastic Son of Rambow-eqsque scenes and you have one of the funniest and memorable double acts in young adult literature. I really loved Greg, both as a character and a narrator. He was fresh, original and definitely the kind of person I would want to punch in the arm on numerous occasions. Yeah, he wasn’t always likeable but what seventeen year old boy is? I could chat on for a bit about all my favourite Greg moments but when I went back and looked at my notes I realised I’d pretty much highlighted everything for the first few chapters and then I gave up and just vowed to re-read it again. This book had pretty much everything: lists, scripts, film reviews. I loved these different styles because they were hilarious, original and really added a lot to the book. The only quibble I had was that some jokes went on for a smidgeon too long and I realised I had no idea how we’d got to that bit and I was probably just laughing because I thought I should be. Oh, except that I also wish there was more Earl. He should get his own book… and television series. I would watch that religiously and probably buy the box set. I loved how this book never set out to trick you and lull you into a false sense of security of laughter only to bombard you with sadness and a message at the end. It stated from the get go that this was a hilarious and ridiculous book and if you were looking for a message and/or meaning, it’s your own fault if you’re left disappointed. “If this were a touching romantic story, in this moment some STRANGE NEW FEELING would wash over Greg, a sense of being understood, in a basic way that he almost never understood. Then, Greg and Rachel would make-out like lovesick badgers. This book doesn’t want you to learn anything! I think the only similarity this book has with a “cancer book” is that you shouldn’t read it in public because seriously, the amount of bellowing laughter this book caused was ridiculous. And kind of embarrassing. My normal, everyday laugh resembles the bark of a dying seal with a cold and this book took that to a whole new level. I’ll let your imagination deal with that one. OK, I’m reading through my review and I’ve realised I’ve not really said anything about this book to convince you whether it’s right for you so I’m just going to stop. Really look forward to see what Mr Andrews writes next. I received an advanced copy of this book from the publishers via Netgalley. Also, LOVE the new look blog!